I find motherhood often makes me a better person, whether I want to be or not. Take for instance, tomato soup. Despite my fondness of tomatoes, tomato soup has always turned me off. One day however, in being presented with a bowl of homemade tomato soup in front of Edie, I realized I needed to at least try it. You know that whole thing about telling kids they have to at least try it to be polite and to see if they like it. Ahem. Turns out I liked it after all. (I chalk up my former distaste of it to my complete & total distaste of all canned soups). I got the recipe and have made it a few times since. Last week, the squirrels finally left me some decent sized (non-grape) tomatoes to pick. Thanks to the 6 inches or so of rain we got last week, all the tomatoes were split and needed to be used asap. Looking for something quick and easy and different, tomato soup it was. It was just the thing for a chilly, rainy day. In olive oil or butter, saute minced garlic and chopped onion. Add chopped tomatoes, salt, pepper and tarragon. Cook until tomatoes fall apart. Puree soup and add cream and/or milk until you achieve the consistency you desire. I like to add a little bit of cream cheese too, for extra creaminess. Serve. I’m still not ready to let go of summer. I love the simplicity of your recipe. Tarragon, yum, and cream cheese never hurt anything! 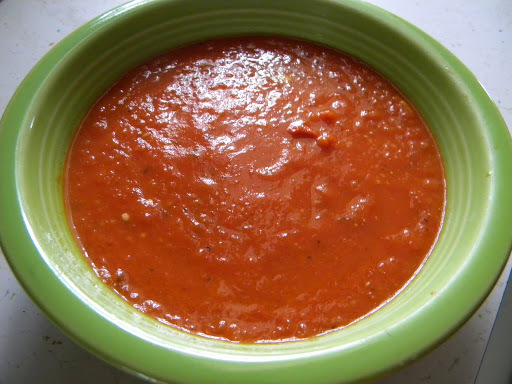 i made tomato soup over the weekend! but i canned it; i realized it was a really good way to use a quantity of tomatoes that was too small to justify canning straight up, but too big to eat fresh. instead of going to all that trouble for a pint or two of diced tomatoes, i ended up with 4 jars of soup. and i was doing watermelon rind anyway, so it ended up being a good use of the time.